Make Works began because we realised that despite a demand for producing things locally, finding facilities and businesses to actually make work can be a confusing, intimidating and frustrating challenge. Based on what we discovered, here are a few pieces of advice to help artists and designers get started working with Scottish manufacturers. Every project is different. In most cases, there are a few companies specialising in specific processes or materials but they are all set up to work in different ways, and are run by different people. Having a clear understanding of what it is you need or how you work makes it easier to match up with the right factory. Also, it might not seem important when you start, but working with a supplier where you get on with the team makes the world of difference in the long term! Are you looking for outsourced fabrication, or for a workshop to experiment with process and make the work yourself? Are you looking for a long-term collaboration with a manufacturer, or is this a short one-off project? Are you wanting to tell a story about this manufacturer as part of your product? Are you looking for a one-stop-shop, or are you looking to subcontract one piece of the process in your production line? Are you looking to directly commission a supplier to produce one of your designs, or are you looking to collaborate on more of an open brief? Are you researching? Are you prototyping? Do you need samples? Are you ready to go into full-scale production? Understanding this can make the difference between working with an open access workshop like Heriot-Watt , a pattern cutter or seamstress, or a larger scale manufacturer like Esk Cashmere. Most places will work from a sketch, or even just an idea, but if you can clearly explain to a manufacturer what stage you are at then the collaboration will be easier. Make sure to consider the added details of your project when you are working out your timeline. You might be manufacturing a fashion line, but do you also need packaging? labels? CAD models? plinths? vinyl? frames? Developing ideas through drawing, scale models, samples or prototypes supports the production process. Thinking through making improves the quality and possibilities of what you can do, and means you can tweak, edit and test things out. It also means you get a better understanding of what you are making, and can show samples to other people to get feedback. Facilities like sculpture workshops, print studios, MAKLab and open-access workshops are great to get started. Explaining the processes or materials and how it works, is part of making and manufacturing. We realised that factories are more likely to respond positively if you have at least a basic understanding of the process they provide, though this is not always essential. There are some resources here to read up on to get you started. Never underestimate the value of a good technician. If you are a beginner to a particular process then ask questions about it. You might an expert in graphics, print and book production - but if a specific project comes up that requires plastics you are unsure how to go about working with it. Technicians are experts in materials and particular processes. Similar projects may have been done before, and there might be a more efficient way to do something (that might end up saving you materials and time.) If you are hearing that there is, then take it on board. Similarly if you feel pressure to compromise a design feature for the production process, ask questions about why that is. Are you doing something out of the ordinary? (Probably.) Are you pushing the way a machine is typically used? (Amazing.) Are you planning on using a material in a new or different way? The off-the-wall projects are the ones that will be remembered - and if successful, highlight the skills and quality of that fabricator. Manufacturers consistently told us that they really enjoyed challenging projects and that this pushed their skillset. If you don’t think that what has been made is up to the quality or standard you hoped for either, have the confidence to say so. Similarly, if you have a bad experience with somebody (especially if you found them through MW) - get in touch and we’ll try to figure out what went wrong. Ask directly about cost, quantities and realistic production times. Factories, manufacturers, and other makers are running a business and are used to answering these types of questions - knowing whether you can afford something is better to know earlier than later on in the process. Do not expect manufacturers to ‘do you a favour’ because you are emerging, a student, or simply creative; try to be financially prepared and be realistic with timelines. Every industry has different peak times and down times. If you are working with a larger factory to produce a one-off or a small run of something then see if you can be fitted in off-season, or at the end of a production run. It might be more commercially viable that way. Keep in mind that these projects often take extra time to complete as you work through the process. Test out and research your ideas as much as you can, so that you can be confident in what you are trying to produce but be patient if things take longer or something unexpected happens. From experience of trying to (and often failing to) secure appointments with factories; we realised that a phone-call with a follow-up email is often more effective than a general enquiries message. Sometimes, just to ask for the best contact to email for your enquiry (do you need sample cards, or is it a production query?) a phone call means you can ask questions and get a response straight away. 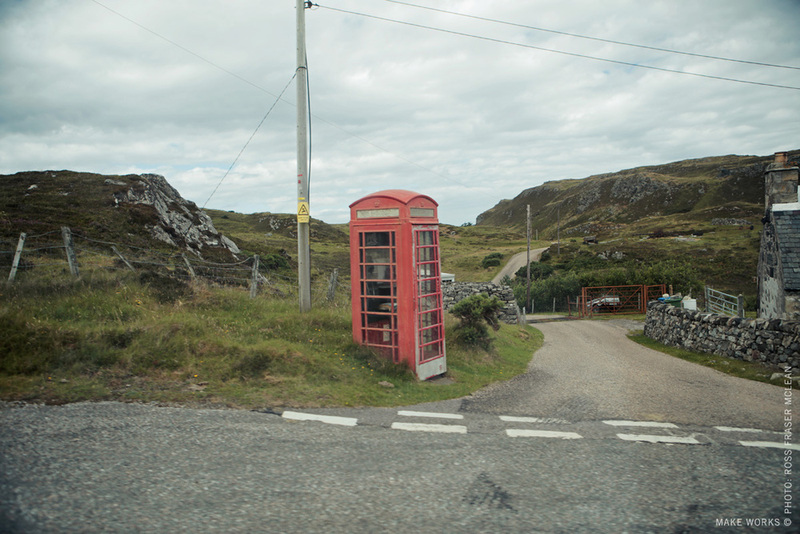 In rural parts of Scotland too, where internet and signal isn’t strong, you’ll have better luck catching someone on a landline. 10. Don't judge a factory by its website. Pixelated images, comic sans, splash pages, complicated navigation and lists of technical jargon (that you probably don't understand) are all typical traits of a manufacturing website. This is not the craft of the manufacturer, it is probably yours. Though improving (particularly in the Textiles trade) remember that web appearances are not everything in this industry building actual relationships with real people is. Use the website to find the phone number and basic information about the process. Looking for any links to previous projects or others they have worked with can also be a good starting point. Be transparent in your intentions, aims and logistics for the project from the start. If it is a direct “send the file – have it made”, then make sure to detail the specifications of materials used, dimensions etc. If it is a longer-term project, make the effort to go and visit the factory, facility or maker and talk face to face about your ideas. This can make the collaboration and development faster and easier as you will have a better physical understanding of the process and/or material. You will also have a better feel of how the company works. Don't flake out with a project or a visit at the last minute either. If something comes up, like your exhibition funding is delayed, or you need to change something (colours, design details, materials etc) just be honest about what is happening. Working locally means that you are creating a stronger network of skills and supporting the local economy. It means that you can meet face to face, and really collaborate on a project. The opportunity is there to work with some of the best makers, manufacturers and materials in the world; and when it is your work coming off the production line it'll be pretty exciting! 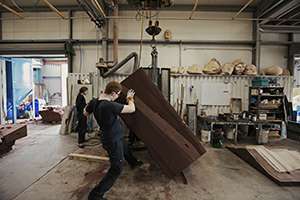 Make Works hopes to strengthen the relationship between the arts, design, fabrication, manufacture, trade and industry. If you have any questions, or need further support you can get us on studio@makeworks.co.uk.